We all know the saying "Having the right tools for job" but what do you do if you struggle to use the "right tools"? The options are either to adapt existing equipment to your own specific needs. Or buy specialist products designed for the disabled hopefully without the extra cost of having a "disabled label". As one size definitely doesn't fit all let's take a look at some ideas for accessible card making and ways to adapt existing tools. Reduced hand grip or swollen joints can make paper cutting with scissors difficult or even impossible. Adaptive scissors are a reasonable price and functional. Peta UK have an excellent selection to suit a variety of needs. Their Easi Grip scissor range have spring loaded handles that are lighter than standard scissors. 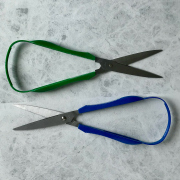 The Mini Grip scissors are the smallest in the range ideal for children or small hands. When holding them in with your hand a slight squeeze moves the blades backwards and forwards. Only full pressure will allow the blades to close completely. 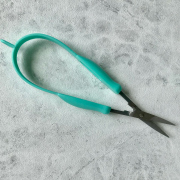 The adult version has a pointed tip perfect for fussy cutting or snipping bits of paper. The Easi Grip scissors are larger and have right and left handed options. The long loop handle allows the scissor to reopen when the pressure is released. The adult version has a pointed tip like the Mini Grip scissors. It is more suited to cutting larger pieces of paper than intricate cutting. 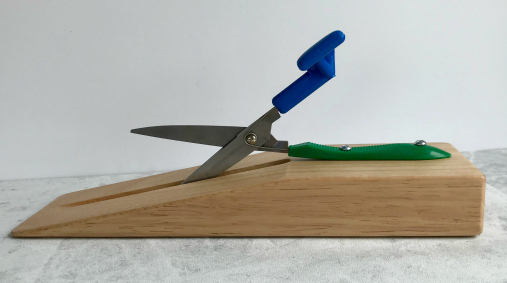 The Mounted Table Top scissors are fixed on a wooden base. The base has small non slip pads on the bottom. A hidden spring automatically reopens the scissors after every cut. It is suitable for anyone working one handed, or with poor hand control. It can also be used by carers working with an individual who need hand over hand assistance. The Fiskars Softtouch micro tip scissors are ideal for anyone with a weak grip or arthritis. The ergonomically designed handle with a spring action makes it easy to open and close the blades. Other cutting aids include paper trimmers, guillotines and die cutting. Depending on your disability or impairment the kitchen or dining room table may be all you need. However for someone in a wheelchair or chair/bed bound a height adjustable table makes crafting easier. An adjustable table also allows you to change your position from sitting to standing to reduce back pain. The Overbed Table tilts and adjusts to size. It is a basic high low table that is standard issue from Occupational Therapists in the UK. The table can be used with an armchair or over a bed. For wheelchair users you need a carer to position the back table leg behind the front wheels of the wheelchair. It works well until you accidentally move your wheelchair. Cue crafting bits flying across the room! A much better option especially for wheelchair users is a Fully Adjustable Overbed Table and Overchair Table Desk. Although more expensive than the Overbed Table it has a number of features that make it easier to use. It can be moved around on the casters or locked into position. It has an open entrance for a wheelchair user to wheel straight into. And finally, it has a small separate extension - great for a cuppa that can be positioned on the right or left hand side. If you have the space a full length high low table is the ideal. IKEA have introduced an adjustable office table (Bekant) at a reasonable price. Fully height adjustable ergonomic tables with manual or electric controls can be purchased from Posturite. The prices reflect the quality of the products. If gripping a pen or pencil is painful or difficult there a a number of low cost aids that can help. Large grip pens are available but why buy new pens when you can adapt your own! Plastazote tubing is a quick and easy way to create a more comfortable grip. It's available in one metre lengths and three different hole sizes. Just slide the tubing over your pens to make a wider easier grip. Pen and pencil grippers are widely available from stationary stores to slide onto normal sized pens and pencils. Magnifiers come in all shapes and sizes from the classic magnifying glass to electronic magnifiers. For occasional the use a small pocket hand held magnifier may help you see fine detail. Do check the level of magnification as each one is different. If you have significant sight loss take advice from a Visual Impairment (VI) professional. The RNIB Magnifier section shows the complete range of products available. Dycem mats provide a secure non slip surface. They have a sticky feel but won't stick permanently to your table. The mats come in all shapes and sizes. If you need a large piece for your craft table the most cost effective way is to buy a roll of Dycem and cut to size . The Dycem on a roll is thinner than the mats. If you position your ink pad on a mat for stamping it will not move when you apply pressure with the stamp. This is great for anyone working with one hand as you don't need to hold the ink pad. If the mat gets inky just wash it with soap and water. Find out more from the Disability Grants website. If something is too difficult try to find another way of doing it. There is never a wrong way just different approaches to achieve the same result. The best ideas are those that work for you. So remember, Do It Your Way! Look out for the blue boxes with tips throughout the website for additional accessibility ideas for specific tasks.